The Menagerie, Parts I and II, are the eleventh and twelfth episodes of the first season of the American science fiction television series, Star Trek. Written by series creator Gene Roddenberry and directed by Marc Daniels (part one) and Robert Butler (part two), it is the only two-part story in the original series. Part I was broadcast by NBC on November 17, 1966, and Part II was broadcast on November 24, 1966. In the episode, Spock abducts his former commander Christopher Pike, locks the Enterprise on a course to the forbidden planet Talos IV and turns himself in for court-martial where he presents an elaborate story explaining his actions. The complexity of Star Trek's production had steadily increased the show's production time, leading to concerns that Desilu Productions wouldn't be able to deliver episodes to NBC in time to meet their series commitments. "The Menagerie" was created as a means to reuse footage from "The Cage" — the unaired 1965 pilot episode of Star Trek — within a frame story as the early history of the starship Enterprise. As such, the two-part episode only required a week of production time. "The Menagerie" was positively-received, and won a Hugo Award for Best Dramatic Presentation. 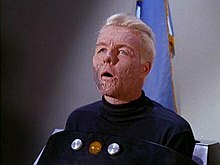 The disabled and badly disfigured Fleet Captain Christopher Pike. On stardate 3012.4, the Federation starship USS Enterprise arrives at Starbase 11 in response to a subspace call First Officer Spock (Leonard Nimoy) reported receiving from the former captain of the Enterprise, Christopher Pike (Sean Kenney), under whom Spock had served. Captain Kirk (William Shatner) and Spock meet the starbase commander, Commodore Mendez (Malachi Throne). Mendez informs them that Pike could not have sent any message, as he is unable to move or communicate other than answering yes/no questions with the aid of a device operated by his brainwaves. Pike refuses to communicate with anyone except Spock. After Kirk and Mendez leave to discuss the situation, Spock reveals, over Pike's repeated "no" signals, that he intends to carry out a plan that he has made. On the screen, the Enterprise arrives at Talos IV in response to a distress call from the survey ship Columbia, lost 18 years previously. Pike (Jeffrey Hunter), Spock, and a landing party beam down to the planet, and find a number of survivors including a young woman named Vina (Susan Oliver), who was born shortly after the crash of Columbia. Dr. Boyce (John Hoyt), Pike's chief medical officer, establishes that the survivors are all in perfect health, despite the circumstances. Vina promises to show Pike the secret of their health, and leads him to a rocky knoll. Two aliens emerge from a hidden door, stun Pike, and carry him through the door. Vina, the other survivors, and their camp suddenly disappear. Pike has been abducted by the Talosians, humanoid aliens with the power to create illusions indistinguishable from reality. The scene is interrupted by a message from Starfleet Command, which reveals that the images they have been viewing are being transmitted from Talos IV. Mendez is placed in command of the Enterprise, but Spock begs Kirk to see the rest of the transmission. Spock's trial continues, and the transmitted scene resumes with Pike in a cell with a transparent wall. The Talosians begin their "experiment", which consists of a number of illusory situations involving Pike and Vina. The Talosians' hope is that Pike and Vina will mate and found a race of slaves who will reclaim the war-damaged surface of the planet. Meanwhile, the Enterprise crew fails to break into the underground complex with weapons enhanced by the ship's power. A landing party attempts to beam into the complex, but only the female members arrive, in order, as the Talosian "Keeper" explains, to give Pike more choices for a mate. An attempt to blast through the cell wall with the new captives' phasers fails as the weapons are apparently non-functional. That night, Pike is able to capture the Keeper as he attempts to confiscate the weapons. Pike intuits that the phasers still function, and that their escape attempt was thwarted by an illusion. He forces the Talosian to reveal a hole in the cell wall. The humans proceed to the surface, but learn that this was the Talosians' plan. Number One (Majel Barrett, billed as M. Leigh Hudec) sets her phaser on overload, preferring to die rather than be enslaved, but deactivates the weapon when more Talosians arrive. The aliens have found that humans' "unique hatred of captivity" makes them unsuitable for the Talosians' plans, which must therefore be abandoned. Pike desires an apology, but the Talosians point out that this failure spells the death of their species. Pike offers help from the interstellar community, but the Talosians fear that their mental powers would spread and bring other races to ruin. As the rest of the party are beamed back to the ship, Pike is shown that Vina's appearance up to now has been an illusion. In reality she is much older, and was severely deformed by the crash of Columbia. She elects to stay on the planet, and Pike returns to the ship. The transmission ends as the Enterprise arrives at Talos IV. Commodore Mendez suddenly fades away, and the Keeper appears on the viewing screen, informing Kirk that Mendez's presence was an illusion. The court-martial was a ploy to buy time to bring Pike back to Talos IV, where, if willing, he would be able to enjoy the illusion of a normal life. A message from Commodore Mendez then advises that Starfleet has waived the prohibition against contact with the planet for this one occasion, and that Kirk is free to proceed as he thinks best. Pike is transported to the planet, and the rejuvenated Pike and Vina are seen on the viewing screen returning with the Talosians to the underground complex. The Keeper appears one last time to wish Kirk well. "The Menagerie" was a solution to a large and growing problem with the show's production; its special effects, unprecedented for a weekly television production, were causing delays in the completion of each episode. The problem was cumulative, with shows getting delivered to NBC later and later. In order to fulfill their series commitment with NBC, Roddenberry wrote a two-part episode that needed only one week of production, and would reuse a large amount of footage from the then-unaired original pilot of Star Trek, "The Cage". New filming took place for the framing story for "The Cage". Because actor Jeffrey Hunter was unavailable to reprise his role as Captain Pike, a look-alike actor, Sean Kenney, played the injured captain in the new scenes, although Hunter was represented in flashback footage and credited accordingly (along with the other original "Cage" cast). Also in the new scenes, Malachi Throne (who provided the voice of the Keeper in the original "Cage") portrayed Commodore Jose Mendez, while Julie Parrish played personal assistant Miss Piper. Because Throne played a second role in "The Menagerie", the Keeper's voice was electronically processed to sound higher-pitched. (This modified voice would replace Malachi Throne's original voice work in the remastered and new "Original" versions of "The Cage" released later, and allowed 'The Keeper' to then address Captain Kirk by name at the conclusion of part two when he advised Kirk he was hearing the Keeper's thought transmissions and that the invalid Fleet Captain Pike was welcome to live with them unfettered by his physical body, further addressing Kirk by name as the illusory fully able-bodied Pike is seen walking with Vina, the Keeper wishing Kirk as pleasant a future.) The preview trailer for Part II uses Throne's original Keeper's voice. The framing story was directed by veteran Trek director Marc Daniels. Because most of his footage was used in Part I, he was given directing credit for this part. The director of "The Cage," Robert Butler, was given credit for Part II, because most of that footage was from the original pilot. Susan Oliver actually plays the slave girl painted in green makeup and dancing for Captain Pike. During preproduction makeup tests (using Majel Barrett as a stand-in), they sent the footage out for printing and when the film returned, there was little difference. The lab thought there had been an error in colorizing and thought they should compensate. The first time this happened, they reshot the film with a darker green and sent it out again for printing. The same thing happened again, but eventually the lab was notified to make no color changes. Footage from the master negative of "The Cage" was edited into the master negative of "The Menagerie". No other color or 35 mm copy of "The Cage" existed, only a black and white 16 mm print owned by Gene Roddenberry. In 1987, the full-color negative "trims" from "The Cage" that had not been used in "The Menagerie" were discovered at a film laboratory in Los Angeles and returned to Paramount Pictures. "The Menagerie" is highly regarded by fans and in 1967 it won the Hugo Award for Best Dramatic Presentation, one of only two episodes in the original series to do so. Zack Handlen of The A.V. Club gave the episode a 'B-' rating, noting that "the whole thing plays out over two hours, and with a framing story from the regular cast that, while dramatic, doesn't quite gel." Handlen did note some memorable aspects of the episode such as the extent of Pike's injuries and the ambiguity around his final fate. In 2017, Space.com ranked "The Menagerie" the 3rd best episode of all Star Trek television. On November 13 and 15, 2007, the digitally remastered version of "The Menagerie", in high definition and with Cinema Surround Sound, was released in theatres as a special two-night-only showing. It included a message from Gene "Rod" Roddenberry Jr., a 20-minute "making of" documentary about the restoration process, and a trailer for season two of the remastered series. This presentation was also shown in the United Kingdom for distribution for one night only at selected Odeon Cinemas on November 13, 2007. Some repertory movie theaters in North America showed the classic two-part episode as a feature film in the 1970s. Basically, the two original series episodes were shown back-to-back and unedited as part of one program. One such theater, the Seville in Montreal, showed 16mm prints of "The Menagerie" episodes on a big screen as part of a program that concluded with the presentation of the Star Trek blooper reels from seasons one and two. ^ The video footage used is actually from Star Trek's first pilot, "The Cage". ^ Whitfield, Stephen E & Roddenberry, Gene (1968). The Making of Star Trek. Ballantine Books. p. 115. ^ "The Cage Page: Behind the Scenes of Star Trek's First Pilot". StarTrekHistory.com. Retrieved June 27, 2012. ^ Stephen E. Whitfield and Gene Roddenberry, The Making of STAR TREK, 1991. ^ Handlen, Zack (February 20, 2009). "The Menagerie". The A.V. Club. Retrieved September 5, 2009. ^ Entertainment, Elizabeth Howell 2017-09-20T16:19:28Z. "The 10 Best 'Star Trek' Episodes Ever". Space.com. Retrieved March 26, 2019. ^ "Star Trek: The Menagerie ENCORE". FathomEvents.com. November 15, 2007. Archived from the original on December 27, 2008. Wikiquote has quotations related to: "The Menagerie, Parts I & II"
This page was last edited on 26 March 2019, at 18:14 (UTC).